This manual represents several years of labor by dedicated co-workers. 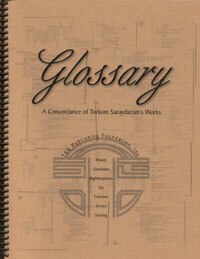 Organized in alphabetical order, it contains thousands of words and phrases that have been used by Torkom Saraydarian in his writings and speeches. The explanation of each entry is taken directly from his books so you will be reading his words and see the context in which they were used. This will give you a brief introduction to a word or a phrase and, if you wish to read more, you can easily go to the sources for more information.